Capricorns are ruled by Saturn, making them realistic, maybe even pessimistic. Capricorns are honest, dependable, responsible, persistent, mature, and serious. They are leaders, career oriented, and usually attain their goals by climbing the mountain much like the goat - their symbol, until they arrive at the top. 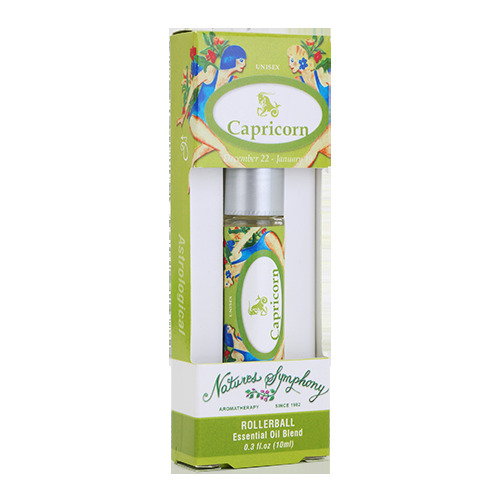 This blend includes oils ruled by the sign and in tune with Capricorn nature. Ingredients: Fractionated coconut oil (Cocus nucifera), with Organic/wildcrafted essential oils of eucalyptus (eucalyptus globulus), benzoin (styrax benzoe), camphor (cinnamonum camphora), bay laurel (laurus nobilis), cajuput (melaleuca cajuputi).